You know what they say about Steam libraries, right? “There’s always room for one more.” This weekend you can pick up a free copy of Stories: The Path of Destinies and have it for keeps. It’s a charming-looking action RPG that emphasizes the importance of choices, and how these can have cascading influence on how a story develops. 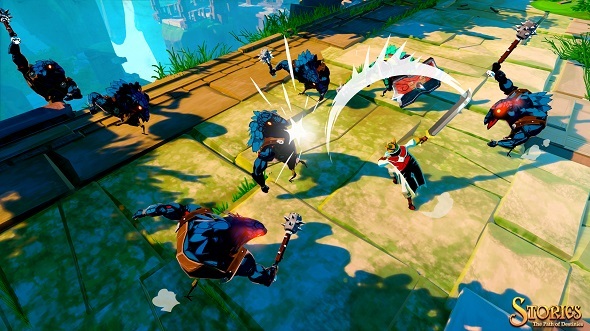 Stories: The Path of Destinies plays with the idea of permadeath, and gives your character – a lively anthropomorphic fox pirate – a chance to learn and grow each time he falls in battle, or due to the unforeseen consequences of a choice he’s made. The game netted an aggregate 74 on Metacritic when it launched, and Steam users have “very positive” (85%) reviews. Developers Spearhead Games have also created Tiny Brains, Arena: Cyber Evolution, and Omensight, which launches May 15. I haven’t had a chance to play it yet myself, but it’s reportedly a fairly short game – perfect for staying in on a rainy weekend with.